It’s an Italian. 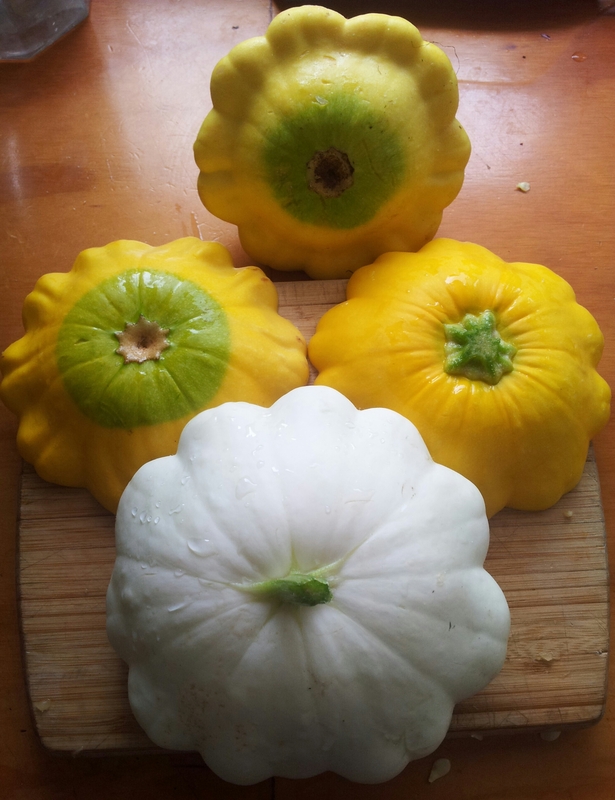 Around the world it’s known as pattypan squash, granny squash, sunburst squash or custard marrow. In New Zealand it’s called Scallopini. This rather perfect looking vegetable in Birthe’s basket at Sanctuary Community Gardens caught my eye and my immediate thought was of a flying saucer. 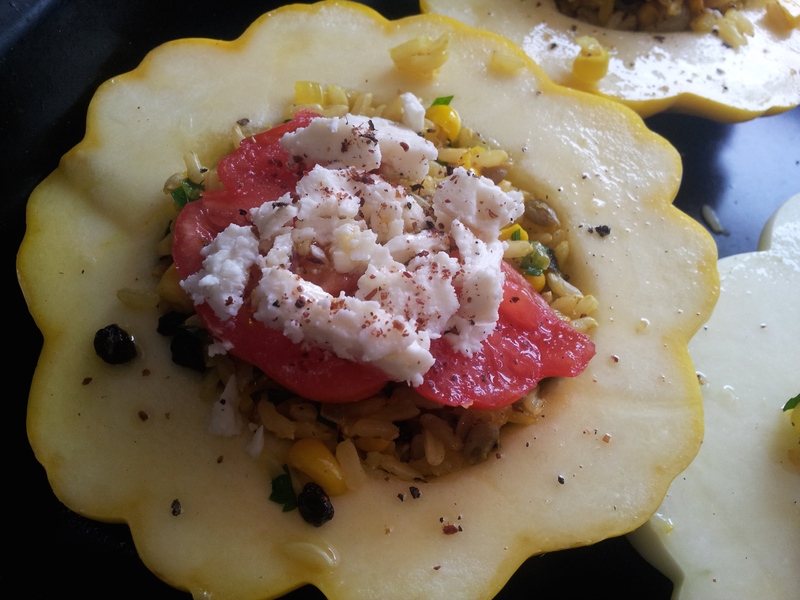 It’s really just a fancy shaped zucchini from the summer squash family Cucurbita pepo. 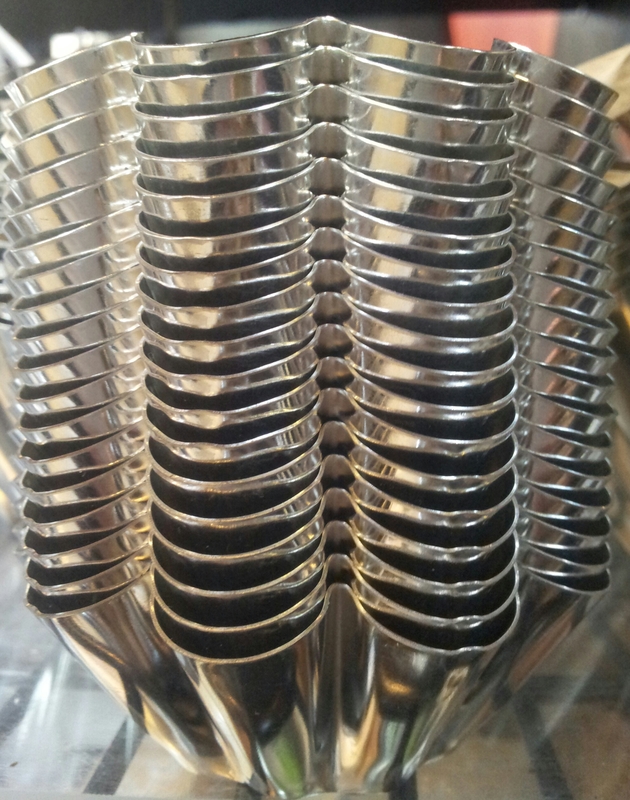 A stack of brioche tins at Milly’s Kitchen shop, Ponsonby. The nickname Pattypan squash came about because of the scalloped shape that resembles the similar shaped cake or brioche pans. On a recent visit to our Sanctuary Community Gardens I was handed a cluster of scallopini and a challenge. Trevor asked if I could come up with a recipe that would showcase the scallopini. Trevor suggested I get a shot of Beau with the scallopini patch behind him to show how large they grow. 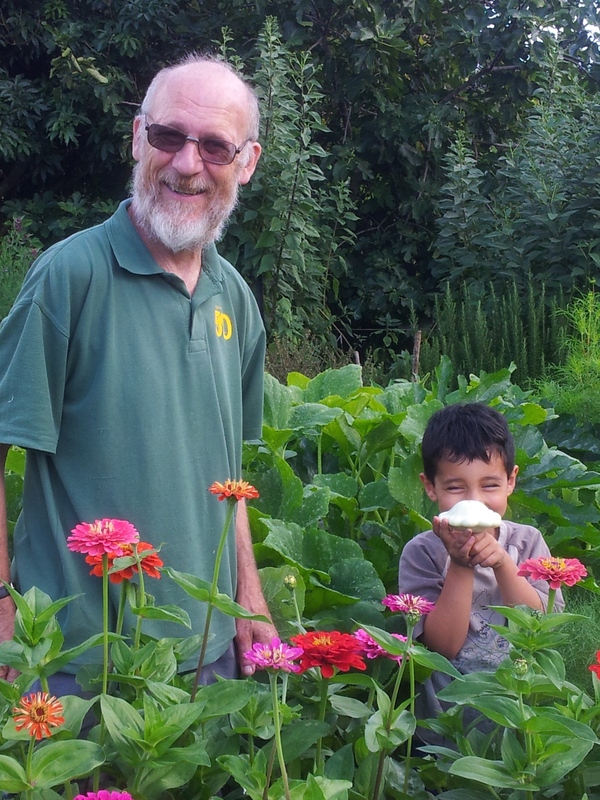 Trevor Crosby (left) and Beau right with a scallopini at Sanctuary Community Gardens. My grandson, Beau, told me “Trevor knows a lot of things”. I have to agree. It’s thanks to Trevor’s knowledge and caring for the scallopini and the gardens in general that there is such an abundance for us to share. Scallopini can be used just like courgettes or zucchini; thin slithers raw in salads, sautéed in garlic and fresh herbs and put together with pasta and parmesan cheese, or as an ingredient in a ratatouille or vegetable stew. 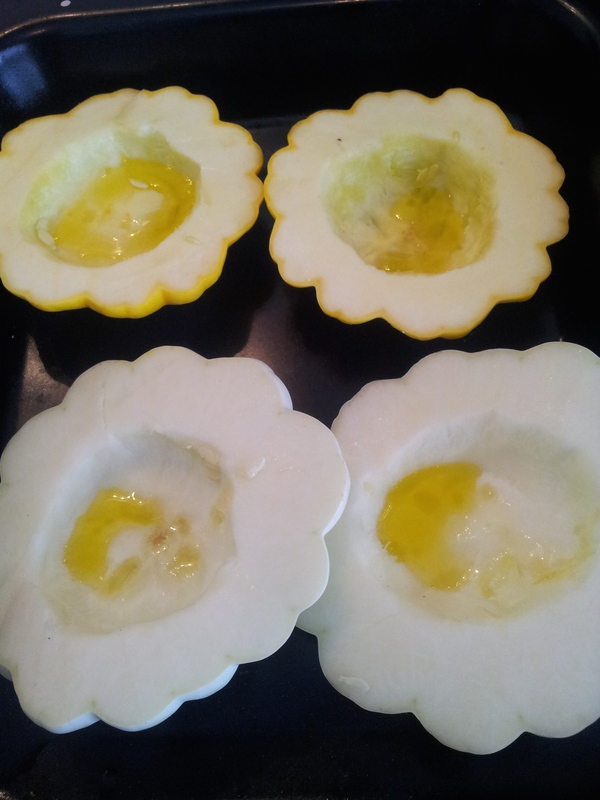 I decided baking them would be the way as their signature scallop edges would be retained. The dish that was the outcome of the challenge that I have called “Trevor’s Spicy Rice Scallopini” with tomato and basil sauce. 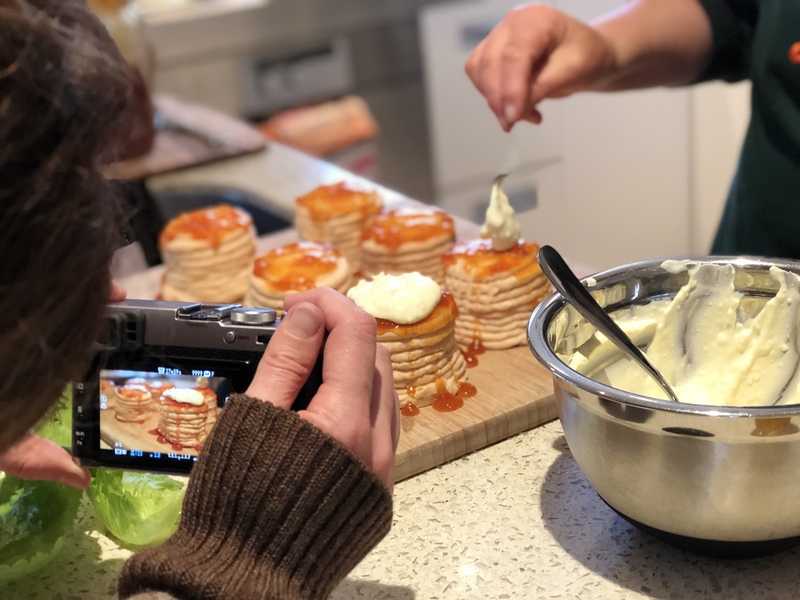 I started the challenge by looking through my recipe books… then decided just to make something up with the ingredients I already have in the pantry. 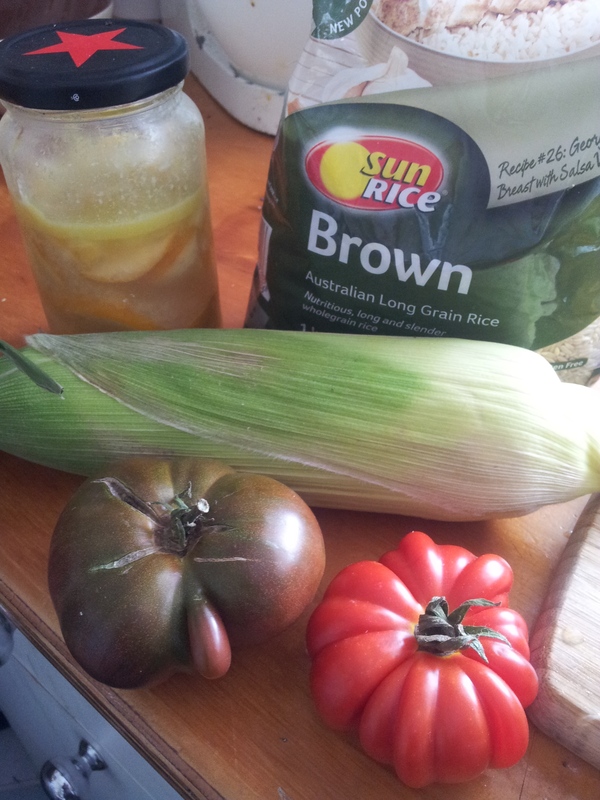 I had brown rice, corn, preserved lemon and a couple of Italian heritage tomatoes from the gardens. While the rice cooks, saute onion until soft. Bottom left: fennel seeds that I gathered from the gardens and dried myself, Centre: sage that I also picked and dried but you can use fresh instead, and Right: one of our garlic cloves grown at the Gardens. 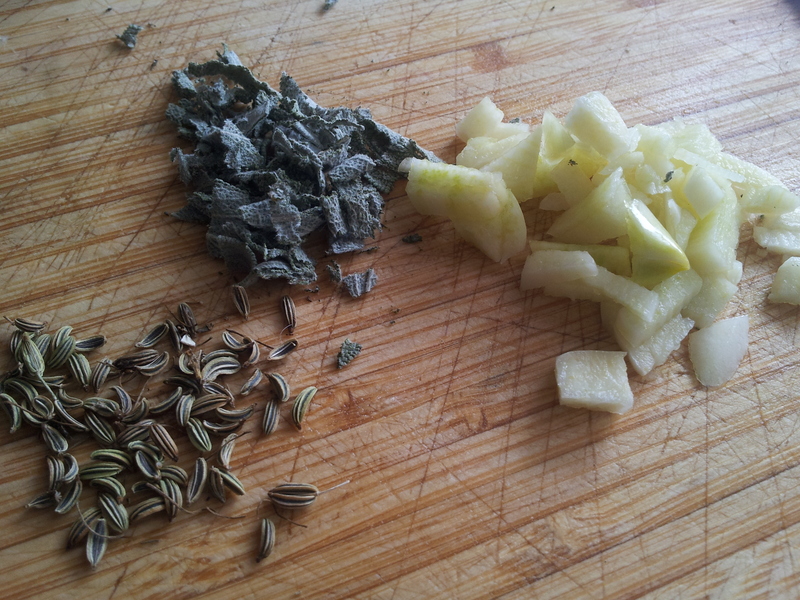 For flavourings I used about a teaspoon each of fennel seeds, dried sage and one large garlic clove chopped. 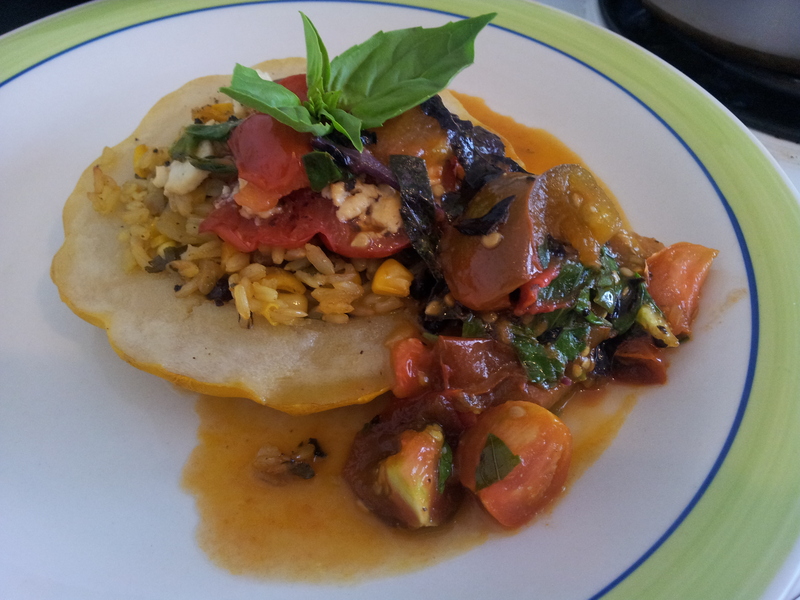 Whenever I can I add turmeric to dishes because it is so good for you and adds colour. 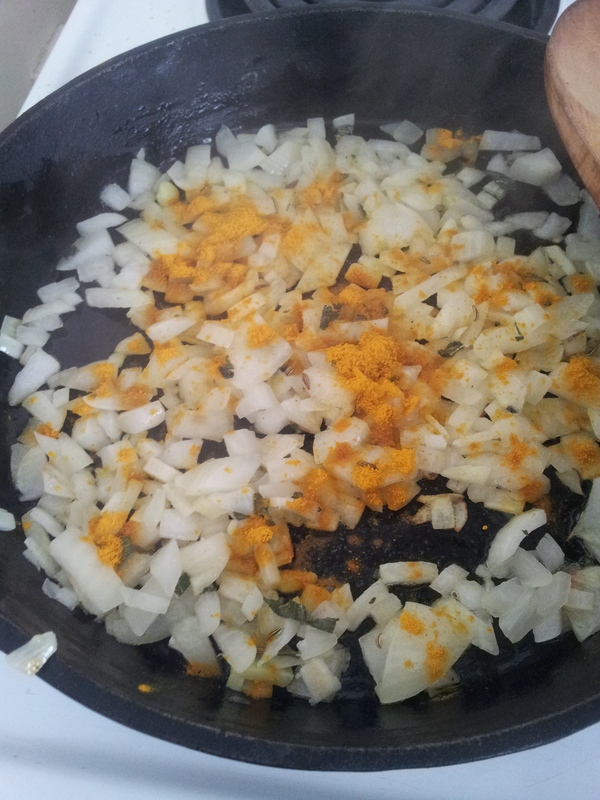 I added these to the softened onion along with 1 tsp of turmeric. I wanted to use preserved lemon so decided this dish would lean towards the middle east in flavour. 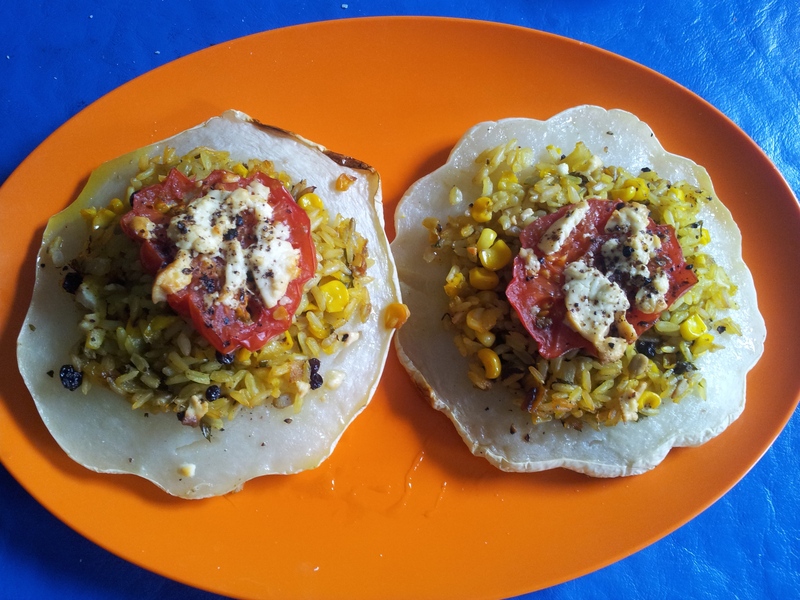 You could use red peppers instead of corn to give colour and something sweet. 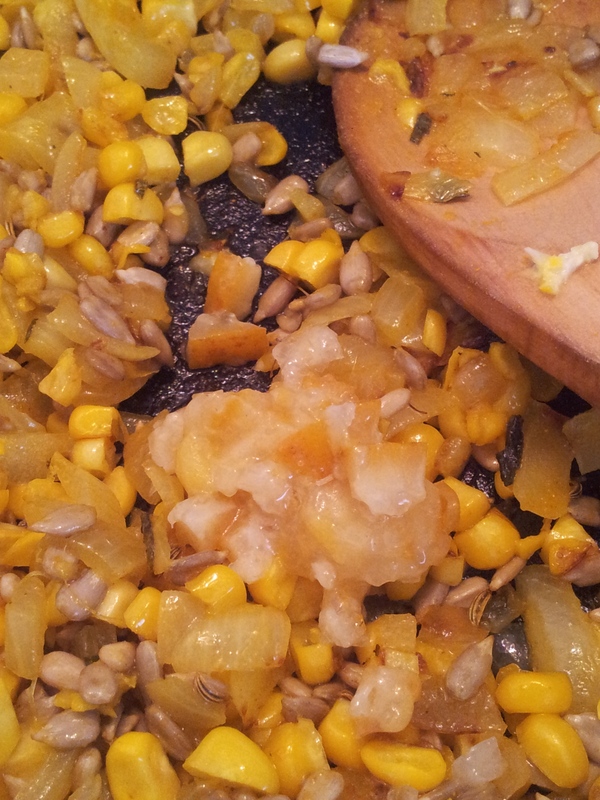 You can also just use canned corn kernels. I had one corn cob left and knew this would make my scallopini attractive to Beau who loves corn. 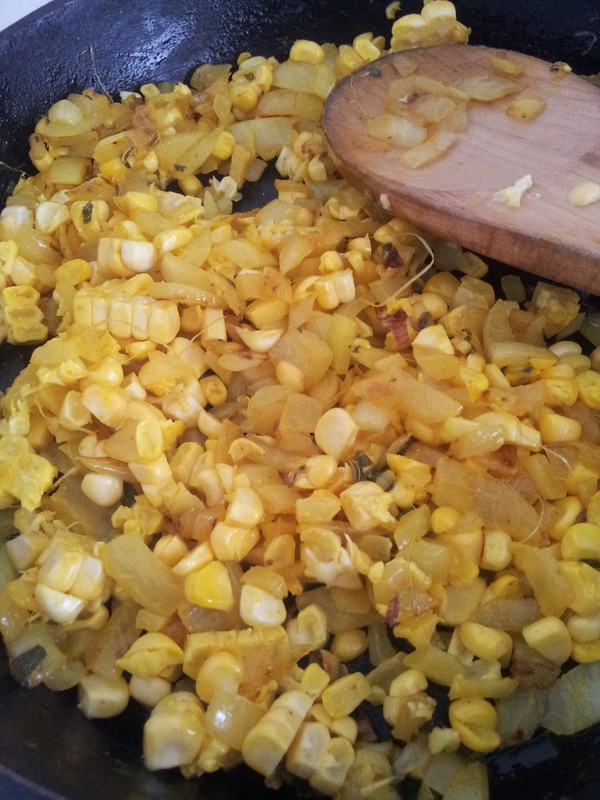 I cut the cobs from the uncooked cobs by sliding a knife down where the corn meets the husk. There were quite a few stringy fibres that I plucked out before adding to the spiced onion mix. Instead of corn you could use red peppers and a chilli if you want to add some heat. Next I thought about adding some nuts. 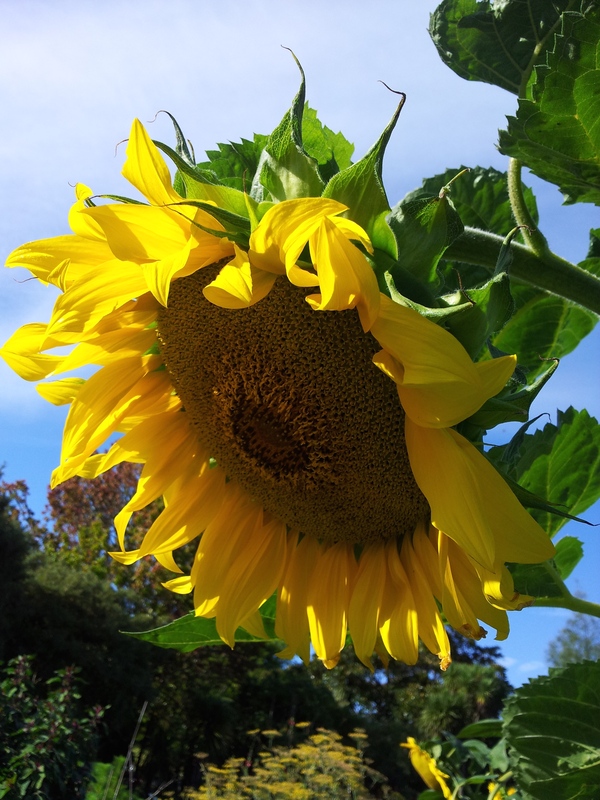 Almonds would be a delicious addition but on this occasion I use seeds – 1/4 cup of sunflower seeds in recognition of the great display we have of sunflowers at our gardens. Sarah who planted all the sunflowers named this particular sunflower “Ernest”..because he stood the tall and proud delaying flowering until the week of the Auckland Heroic Garden tours when our community garden was on show. Ernest has been selected as the seed provider for next year’s crop. When using preserved lemon don’t salt your food until you have added the lemon because it’s very salty and I found I didn’t need to add any extra salt. I cut up some slices of preserved lemon (rind, flesh and salt altogether). 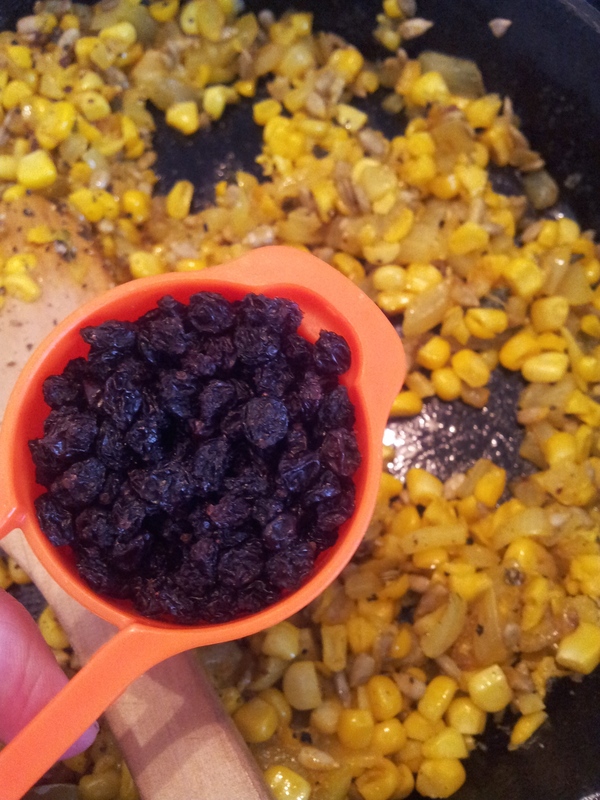 In keeping with the middle eastern theme I added 1/4 cup of currants to add something sweet. 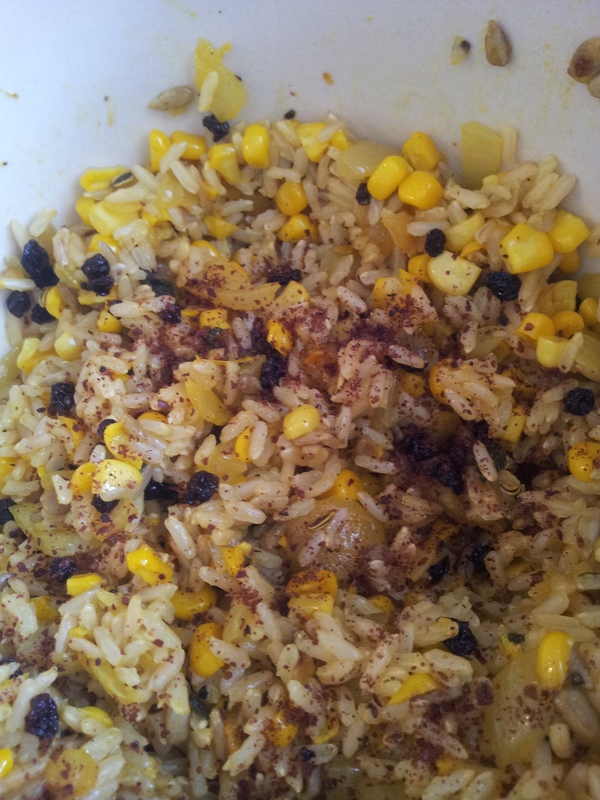 I mixed the drained cooked brown rice with the spiced onion and corn mix, and had a taste. It was delicious but I felt it just needed one more spice. Sumac is native to Iran and is a reddish purple. Sumac comes from berries that are dried and is usually sold ground. Sumac or sumach has a fruity astringent taste that is used in middle eastern cooking especially sprinkled over rice, salads, fish and stews. A good sprinkling gave the rice the flavour I was looking for. Scallopini has a nutty flavoured flesh denser than zucchini and they keep for longer in the refrigerator. At last the scallopini come onto the scene. 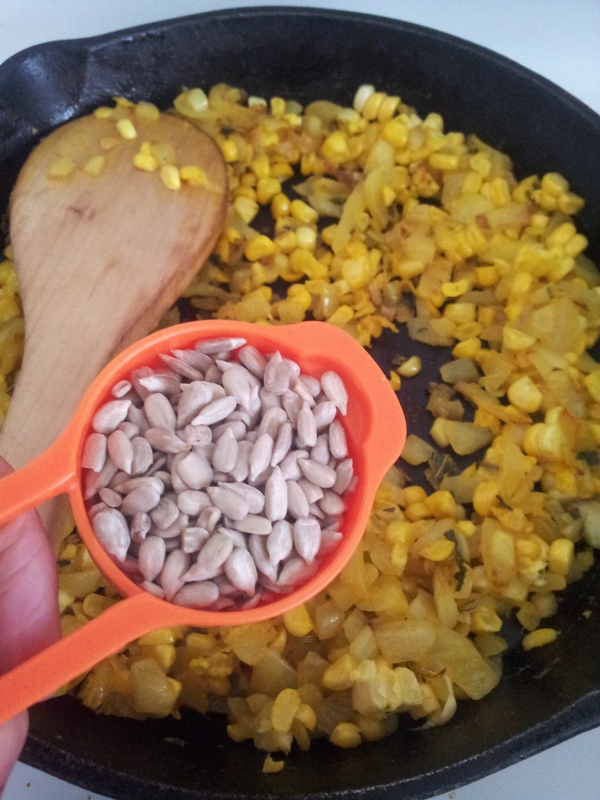 They are easy to cut in half and with a spoon just scoop out the seeds to make a little dish for the rice filling. The scallopini I chose were the size of a saucer. They do grow larger and Trevor says they don’t get stringy like marrows even at this large size, but they are at their best when not too large. For me the scallopini the size of a saucer are a good size for stuffing. 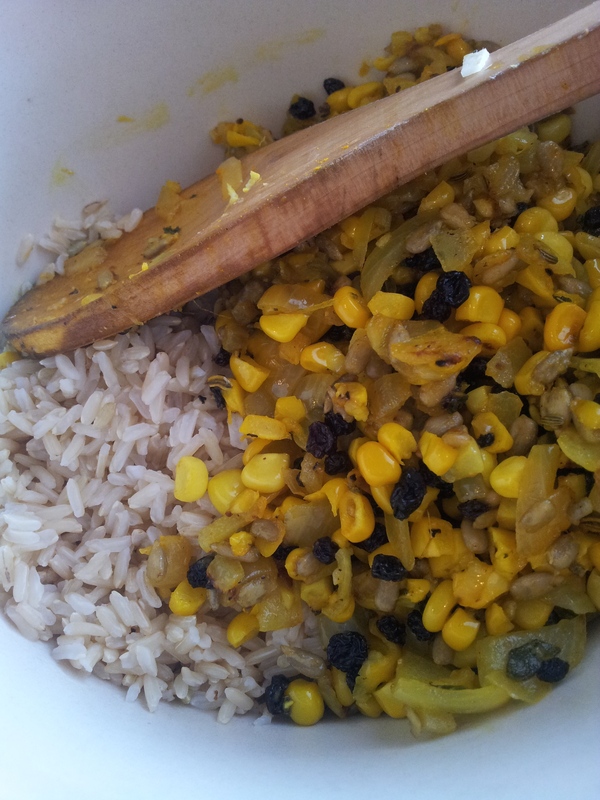 The seeds from one packet turned out plants with yellow and creamy coloured fruit. For me I gravitate to the cheery yellow ones. Kings Seeds have a variety called Squash Sunbeam F1 that has good resistance to powdery mildew. I add some oil and with a brush sealed the scallopini flesh. The cavity is then filled with the mix then add thick cut slices of meaty tomatoes on top, (heritage Italian tomatoes also from the gardens) . The final touch is a little crumbled feta with another sprinkling of sumac. I place them in a large oven tray and cover with foil to cook at 180C for at least an hour. The flesh is nice and juicy but to add more moisture and a luscious red, I made a tomato and basil sauce by melting butter and quickly frying two of those lovely beefsteak tomatoes, chopping in basil towards the end of cooking and seasoning with salt and pepper. With the amount of rice mix I had I could have stuffed twice as many scallopini than I did. This mix could easily cover 4-6 whole scallopini (up to 12 halves). It’s also good as a rice salad. Trevor’s challenge has been fun and I hope he enjoys the recipe. I have decided to call the dish Trevor’s Spicy Rice Scallopini. Focusing this week on scallopini has delayed my post about kefir that I have been promising to write about. Kefir can wait but not so an abundance of scallopini – just like courgettes they are only in plenty at this time of the year. 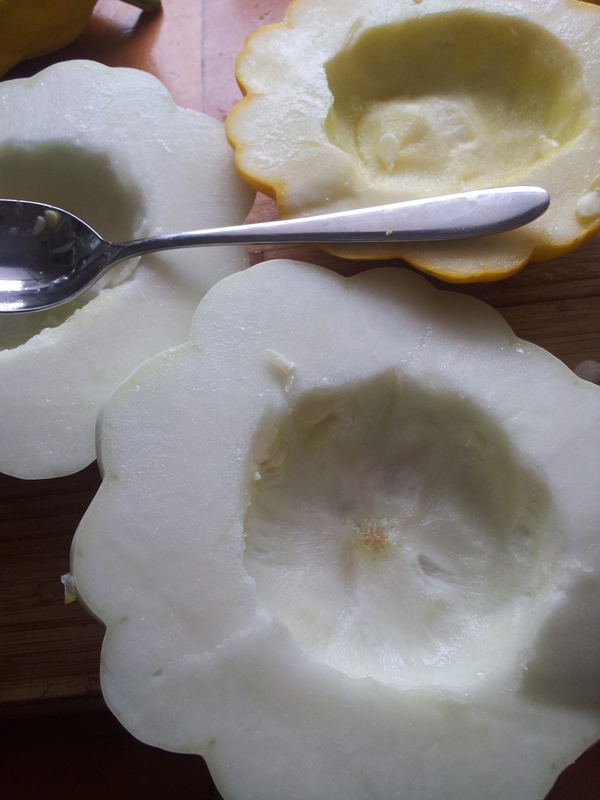 This recipe can be used for any squash, courgette or pumpkin. Never fear kefir is coming up next. I have been experimenting with it and have discovered many ways to incorporate it into our diet. There may even have to be a couple of posts dedicated to this gutsy topic.